Roanne Weisman, a healthcare writer from Boston who has Marfan syndrome and long-time member of the Foundation, had a conversation with Hal Dietz, MD, Victor A. McKusick Professor of Medicine and Genetics, and Director, William S. Smilow Center for Marfan Syndrome Research, Johns Hopkins University School of Medicine, to get a basic understanding of Marfan research to share with our community. What is a gene anyway? A gene is a segment of our body’s DNA that tells cells how to make proteins. DNA, (deoxyribonucleic acid) is the carrier of genetic information that makes us human, but also makes each of us unique. Every cell in a person’s body has the same DNA. For most genes we each have two copies, one inherited from each parent. Proteins are the workhorses of the cells that make up our bodies. Each gene encodes (has instructions to make) a specific protein. Each protein has a defined task: Some proteins create our bodies’ structures, such as bones, blood vessels, and organs. Other proteins, called enzymes, carry out specific biochemical activities, such as digesting food and converting it into energy. What is the Marfan gene and how does it cause Marfan syndrome? The Marfan gene encodes for fibrillin-1, which is a component of connective tissue – the material between the cells of the body that binds cells together and gives tissues form and strength. Besides acting like “glue,” connective tissue proteins such as fibrillin-1 can provide instructions to neighboring cells that influence how they behave. There is strong evidence that fibrillin-1 participates in both types of functions. As with most other genes, every person normally has two copies of the fibrillin-1 gene. In people with Marfan syndrome, at least one of these copies has a defective sequence of DNA - also called a mutation - so the “instructions” to make fibrillin-1 are not quite right. As a result, the altered fibrillin-1 has a reduced ability to perform its intended structural and instructive functions. What happens in the body when fibrillin-1 is not working properly? The consequences of defects in fibrillin-1 vary depending on the tissue or stage of development being considered. Selected features of Marfan syndrome, such as eye lens dislocation, are thought to largely reflect failure of a structural glue-like function of fibrillin-1 aggregates (called ciliary zonules) that normal hold the lens in the center of the eye. In contrast, an altered ability of fibrillin-1 to regulate cell behavior is thought to contribute to many of the cardiovascular, lung, and skeletal features of Marfan syndrome. More likely than not, there is a complex combination of multiple factors that dictates when and where features of Marfan syndrome show up and how severe they will be. If the defect is in only one gene, why doesn’t every person with Marfan syndrome have the same symptoms? There is no “common” Marfan syndrome mutation – indeed, more than 1,000 different mutations in the fibrillin-1 gene have been observed. The location and type of mutation can influence the quantity or quality of the fibrillin-1 protein that is made by the cell. This is thought to be a major reason why the severity of Marfan syndrome can vary between families. However, significant variation in severity can be seen among family members with the exact same fibrillin-1 mutation. This can reflect both “environmental” and “genetic” modification. Environmental modification means that our life experiences can influence our health in general and the influence of a genetic predisposition for a specific disease such as Marfan syndrome. It stands to reason that if someone makes good choices regarding medical care, exercise, and diet, for example, that they would be better off when compared to a relative with the same genetic predisposition, but less good lifestyle choices. Genetic modification relates to the fact that we each have many thousands of genetic variants that influence how our proteins behave. Those natural variants have functional consequences, even if they don’t cause diseases themselves. That is why we look and behave differently from each other and from our parents and siblings. In essence, we have each been dealt a different hand with regard to natural gene variants. Sometimes these natural variants can protect people from the consequences of the Marfan mutation, making symptoms more mild. Others can accentuate the consequences and make symptoms worse. 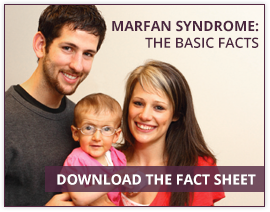 This means that even within the same family, two people with Marfan syndrome may have very different symptoms. What is the focus of current research to improve the lives of people with Marfan syndrome? Thanks to years of research, both our knowledge of Marfan syndrome and our therapeutic approaches have developed. In the early days, we believed that the symptoms simply reflected a localized problem with the fibrillin 1 “glue”: The tissues were weaker because the stuff connecting the tissues was defective. We believed that we needed to figure out how to repair the tissues, and this proved very difficult. However, through the work of a variety of people and labs, we came to the understanding that the fibrillin-1 protein also serves other important functions, and the course of our therapeutic focus has become much more promising. Currently, there is a strong research focus on the ability of fibrilllin-1 to regulate the activity of a class of molecules, called growth factors. These molecules bind to the surface of cells and tell the cells how to behave. One growth factor, TGF-beta, has particular relevance for Marfan syndrome. Normally, TGF-beta is active during fetal development, encouraging growth, but is less active in adults, except at certain times, such as for wound healing. Normally functioning fibrillin is like a “traffic cop” for TGF-beta, signaling it to be active when it is needed and stopping or suppressing its activity when it is not needed. But in people with Marfan syndrome, this signaling system has trouble stopping the activity of TGF-beta. We learned that in in both humans and mouse models with Marfan syndrome, there was clear evidence for too much TGF-beta activity. What does too much TGF-beta activity to do the Marfan body? We and others have focused on problems with the aortic wall enlarging and dissecting, but there is also good work that shows high TGF-beta activity contributes to problems in heart valves, skeletal muscles, and lungs. Has this knowledge led to a therapeutic approach (medications)? There has been a lot of activity to find potential mechanisms to adjust the level of TGF-beta in Marfan syndrome. Using mouse models, we found that a blood pressure drug called Losartan can potently suppress TGF-beta activity and can prevent aortic aneurysm and lung problems. Losartan not only prevented the structure of the aorta from getting too big, but it also fully preserved the normal architecture of the aortic wall. There was also evidence that it could stabilize damage, prevent new damage, and possibly even reverse existing damage. What about Losartan for people? Recent studies have suggested that medications such as losartan show strong promise for the care of people with Marfan syndrome and related disorders – performing as good or better than conventional therapies, such as beta blockers, in various studies. There is both room for improvement and many unanswered questions. Is losartan the best drug in its class (a group of medications called angiotensin receptor blockers or ARBs)? What is the optimal dose? Are there some people who will respond to ARBs and others who will not? Are there combination therapies that should be considered? Answers to these critical questions require more research and future clinical trials. Is personalized medicine on the horizon for people with Marfan syndrome? Individualized treatment is one of the most exciting and promising Marfan treatment research pathways right now. One day we may be able to design the treatment that would be right for each person. That is the goal of the ancillary studies that are still ongoing. We hope that we will be able to look at the genetic makeup of each person, as well as specific measurements of chemicals in the bloodstream, to determine how people are responding to treatments. This will help us predict whether we are on the right track or if we need to modify treatment. What other research efforts have promise? Now that we have discovered the connections between fibrillin-1 and TGF-beta, we are investigating what else might be “downstream” of TGF-beta that could or should be blocked. What are other biochemical pathways that are damaging to people with Marfan syndrome? Can we find effective ways to block those pathways? How does nature modify Marfan syndrome? If we understand how natural genetic variants can protect some people from the consequences of a fibrillin-1 mutation, perhaps we can identify drugs that can mimic nature’s successful strategy. We anticipate that this will be a very exciting and fruitful research direction. Through our website, you can read about the research we fund, enroll in a research study, or support research and progress on Marfan and related disorders. Roanne Weisman, MSW, has been writing for consumers and professionals in the areas of health, medicine, education, and science since 1985. (TheWriteWayToHealth.com.) Roanne has Marfan syndrome, as does her son, Ben Weisman, a Marfan Foundation Board member. The co-author of several award-winning trade health books with physicians, Roanne is a skilled “translator” of medical and scientific information. Her most recent book, In Sickness As In Health: Helping Couples Cope With the Complexities of Illness, is about the effects of serious injury and illness—including chronic conditions like Marfan Syndrome— on intimate relationships.